Whatever your experiential marketing needs are, from trade shows to annual events and marketing tours, we can create a custom built marketing vehicle or signage from concept, sketch or storyboard. Our fabrication team is the best in the business, with the experience and resources to craft custom molding and graphics, paint and body, upholstery and glass, and mechanical services to make your vision a reality. Our fabrication department can help kick your marketing campaign into high gear. We design and build custom cars for commercials and corporations that promote your brand while engaging your customers in a fun, playful way. Team up with our on-site graphics department to create bold visuals that will grab your target customers’ attention. Our high tech facilities can accommodate all of your brand-specific display needs, including point of sale materials. At Cinema Vehicles, we know that creativity is unconventional. Our in-house graphics department can print on a wide range of materials, so you can turn your designs into fabric, upholstery, seats, cushions, chairs and more. Since 1975, Cinema Vehicles has been building its reputation throughout Hollywood as the largest and most reliable picture car company in the industry. Today, our family-run business has expanded to offer the best custom built cars for commercials and corporations in the country. Contact us today to learn more about how Cinema Vehicles can create a custom built marketing vehicle for your business. 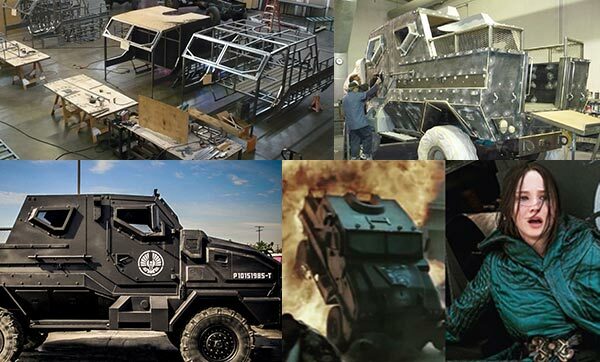 Builds for the 'Hunger Games'.